The beloved disciple, John, gives us a wonderful truth of God; He has placed a powerful gift inside of us that exceeds the power of anything we may come against! Sometimes we seem to consist of a whole clamorous mob of desires, like week-old kittens, blind of eye with mouths wide open, mewing to be satisfied. It is as if two voices are in us, arguing, "You shall, you shall not. You ought, you ought not." Does not God want us to set a will above these appetites that cannot be bribed, a reason that cannot be deceived and a conscience that will be true to God and His standards? We must either control ourselves using the courage, power and love of God's Spirit, or we will fall to pieces. Adam and Eve established the pattern for mankind in the Garden of Eden. All of us have followed it, and then, conscience-smitten, we rankle under feelings of weakness. They were tempted by the subtle persuasions of Satan and the appeals of their own appetites for forbidden fruit that promised something forbidden to them. Even was overcome by temptation. To this they succumbed, and they sinned, bringing upon themselves the death penalty and much more evil besides. What is the use of appealing to men who cannot govern themselves, whose very disease is that they cannot, whose conscience cries out often both before and after they have done wrong, "Who shall deliver me from this body of death?" It is useless to tell a king whose subjects have overthrown him to rule his kingdom. His kingdom is in full revolt, and he has no soldiers behind him. He is a monarch with no power. Someone once said, "If conscience had power, as it has authority, it would govern the world." Authority without power is nothing but vanity. Conscience has the authority to guide or accuse, but what good is it if the will is so enfeebled that the passions and desires get the bit between their teeth, trample the conscience and gallop headlong to the inevitable collision with the ditch? God's love for us will fan His Spirit in us into responding in courage, strength, love and self-control. He who brought quietness and tranquility to the raging maniac—whom even chains could not hold— Mark 5:1-15, will give us power over the one city which we must govern, ourselves. We must not allow self-control to be deprecated in our minds or to be of minor importance because we are persuaded that "Christ did it all for us." Nor can we allow such a deprecation to lead us to abuse God's mercy. Self-control is an attribute of our Creator that Jesus exemplified in His life and that Apostle Paul strongly exhorts us to exercise in ours. If we are to be made in our Father's image, we will yield to God in this matter to glorify Him with our moderation in all things and rigid resistance to sin. Having knowledge of God without the practical experience of self-responsibility is not enough for entrance into the Kingdom. But with the help of God's divine power, self-mastery is produced. The last fruit of the spirit listed in Galatians 5, Self-control, closes the list of the fruit of the Spirit, just as drunkenness and reveling close the list of the works of the flesh (verse 21). 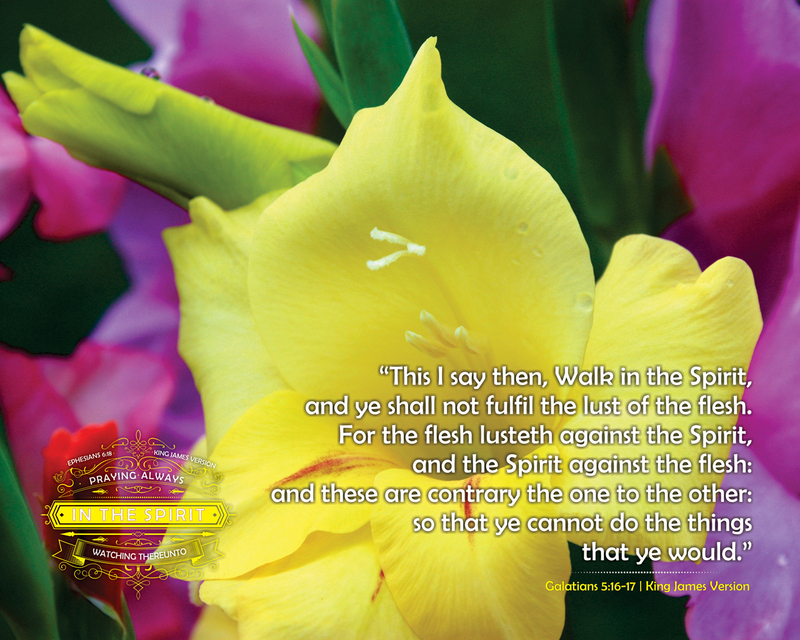 The flesh and the spirit are contrary to one another (verse 17). Self-control is not gained by just suppressing, but by controlling the lusts of the flesh. 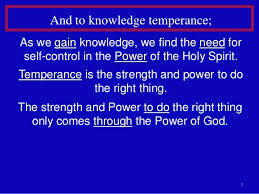 Those who are "led by the Spirit" (verse 18), who "live in the Spirit" and "also walk in the Spirit" (verses 24-25) attain self-control and are on their way to fruitful growth in God's character and spiritual success.